By W. Gardner Selby on Friday, December 8th, 2017 at 4:35 p.m. In 2017, many Texas homes were swamped by Hurricane Harvey and related flooding--including this house in Lumberton. PolitiFact Texas looked into the tally of people left without homes (PHOTO: Contributed to Westlake Picayune). A Texas official's guest editorial, shared on his campaign website, made us wonder about the whopping impact of Hurricane Harvey. Ryan Sitton, a Houston Republican on the Texas Railroad Commission, opened his Nov. 7, 2017, article in Drilling Contractor: "Earlier this year, Hurricane Harvey left more than 12 million people in Texas and Louisiana without homes. The devastation of this storm was more far-reaching than anyone imagined." That many people left homeless? That breaks out to an improbable 38 percent of the states’ combined populations. We sought Sitton’s elaboration; a state aide, Katie McKee, said by email that she’d typed the 12 million figure when she intended to write 1 million. McKee said that we’d brought the error to Sitton’s attention and a correction would be sought. Before we completed this fact-check, the version of his editorial on his campaign site had been amended to say 1 million; Drilling Contractor’s post still said 12 million. McKee told us Sitton intended to say the hurricane left more than 1 million people without homes, per a Sept. 8, 2017, CNN news story stating that after Harvey swirled over southeast Texas for several days, the "storm and subsequent flooding left more than 70 people dead and ravaged nearly 300 miles of the Texas coast and parts of Louisiana, flooding homes and displacing more than a million people." That story doesn’t say how CNN got to its million-plus figure. For our part, we fruitlessly hunted other news accounts estmating the number of Texas and Louisiana residents left homeless. Next, we turned to press releases issued by agencies including the Federal Emergency Management Agency starting after Harvey landed and wreaked havoc in late August and early September 2017. On Sept. 22, 2017, FEMA summed up Harvey’s punch: "More than 19 trillion gallons of rainwater fell on parts of Texas, causing widespread, catastrophic flooding. 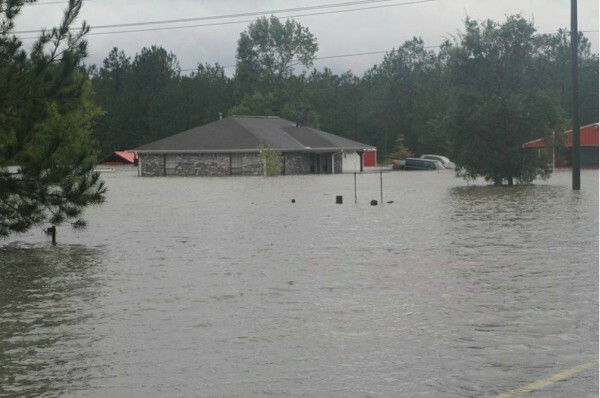 Nearly 80,000 homes had at least 18 inches of floodwater, 23,000 of those with more than 5 feet." So, per FEMA, nearly 780,000 Texas residents evacuated homes. Might that mean that many people were left without homes? A FEMA spokeswoman, Deanna Frazier, initially told us that the agency had "no data on those left homeless as a result of the hurricane." Frazier otherwise said the 792,000 figure in FEMA’s release reflected the number of Texas households that had filed requests by late September 2017 to receive grants for rental assistance, home repair, personal property replacement or direct housing (manufactured housing units or travel trailers). Meantime, we noticed a Texas General Land Office press release, issued in December 2017, quoting the Texas land commissioner, George P. Bush, saying: "Hurricane Harvey affected nearly 50,000 square miles of Texas and damaged or destroyed more than a million homes." By email, Bush spokeswoman Brittany Eck attributed Bush’s "more than a million homes" to an earlier estimate of damaged or destroyed homes made by Gordon Wells, Ph.D., a research associate with the University of Texas Center for Space Research. Eck advised that when Harvey came ashore, Wells was "embedded with the GLO for hurricane response at the State Operations Center run by the Texas Department of Emergency Management." By phone, Wells told us he didn’t have an estimate of Texas residents left without homes by Harvey. But Wells said he estimated the extent of Harvey-caused flooding initially by geo-locating homes for which 338,829 flood insurance claims had been filed by early October 2017. Wells said that far more homes were flood-hit, however, considering that some 80-plus percent of homeowners and renters lacked flood coverage. "If the figure of 339,829 affected structures represents the insured population of homeowners," Wells wrote, "then the total number of impacted structures in the region would rise by a factor of five to nearly 1.7 million, including a large number with only minor water damage," Wells said. "This is higher than my original estimate of 1 to 1.1 million affected structures estimated from the insurance data available in early September." Wells cautioned too that he did not gauge the destructive results of the hurricane’s winds alone. "The distribution of the insurance claims, widespread floodwater detected in satellite and aerial imagery and the tendency for homeowners not to insure their property for flood damage lead me to estimate that water damage of some degree occurred to over one million properties in Texas as a result of Hurricane Harvey and perhaps as many as 1.7 million properties based on the best available data," Wells wrote. Fewer Louisiana residents left without homes? Sharon Karr, a Louisiana-based FEMA spokeswoman, said the federal government issued a major disaster declaration in October 2017 for 20 of the state’s Harvey-affected parishes--including six bordering Texas, a FEMA map shows. Nine of the parishes, Karr said by email, became eligible for aid to remove debris and repair roads and bridges, water control facilities, public buildings and utilities, parks and other recreational facilities. By phone, though, Karr said FEMA did not authorize "individual disaster assistance" awards that could include housing assistance. We separately noticed that Louisiana’s September 2017 request for the disaster declaration said 312 residences in the state were "impacted" by the hurricane, including 19 "destroyed" residences and 48 with "major damage." We also reached Mike Steele of the Louisiana Governor’s Office of Homeland Security and Emergency Preparedness, who said by phone the state doesn’t have a tracking system to tally displaced residents after a disaster. Karr and Steele each suggested we elicit detail about residents left without homes from preparedness officials in Calcasieu Parish. Our attempts to do so didn’t succeed. Sitton wrote: "Earlier this year, Hurricane Harvey left more than 12 million people in Texas and Louisiana without homes." This figure, attributed to a typo, is improbably high. We also didn’t spot an authoritative alternate count though it seems reasonable to say--based on requests for help through FEMA and a state expert’s review rooted in flood insurance claims--that more than a million Texas residents sustained home damage. It looks to us like the hurricane left far fewer Louisianans without homes. We rate Sitton's published claim False. Published: Friday, December 8th, 2017 at 4:35 p.m.